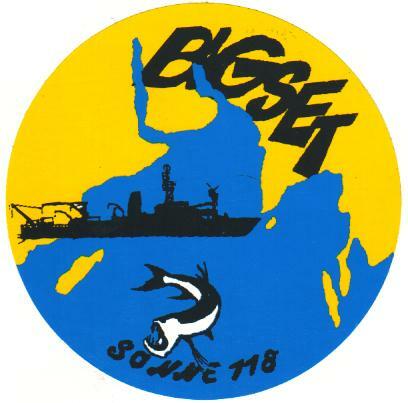 The cruise SO118 with the FS SONNE started end ended in Maskat, Oman. It took six weeks, and during this time we did not see any land. We visited five stations in the Arabian Sea. The main objective of this cruise was the investigation of the geochemical processes in the sediment and the fluxes of dissolved chemical species between sediment and bottom water. Moreover water column processes have been investigated during this cruise. The monsoon winds have a strong influence on the primary production of the Arabian Sea. The northern and eastern parts are high production areas, while the southern and western parts have a productivity that is comparable to other "normal" ocean areas. The plakton that is produced at the surface reach the sediments after sinking trough the water column. The degradation of the organic matter on and in the sediments has a strong influence on the geochemical composition there. We investigated the reaction of the sediment after a plankton bloom. During the whole cruise we had fantastic weather, with maximal wind of 3 Bf. at one day and only one day of light rain. From this point of view it was a very beautiful cruise, and the number of night shifts on that cruise where the CTD had to be deployed were OK.
Sonne cruise 1996 The FS SONNE in the harbor of Maskat, Oman. Sonne cruise 1996 Also the FS SONNE in the harbor of Maskat, Oman, but now fron the other side of the bight. Sonne cruise 1996 Preparation before the cruise starts. This is on of the GEOMAR cooling and laboratory container. Sonne cruise 1996 Here is the cooling and laboratory container shown on the deck, nearely on it's final position. Sonne cruise 1996 On sea, preparation of the GERMAR lander system. The lander is an autonomous system that can make measurements of the sediments, in depth up to 5000m for periods of a few hours up to weeks. This one here is not yet prepared with the measurement equipment. Sonne cruise 1996 Deployment of a sediment trap. Sonne cruise 1996 This is the CTD. I was responsible for during this cruise. The CTD is in the middle of this constuction, around the water sampler bottles can be seen. Sonne cruise 1996 The preparation of the bottom water sampler (BWS) also takes a lot of time. This BWS can collect water a few cm above the sediment. Sonne cruise 1996 This yellow tube is an ADCP, that can measure currents in the water column using the doppler shift effect. Unfortunately this ADCP has been constructed for shallow water but the company told us it will also work in deep water - not it did not!